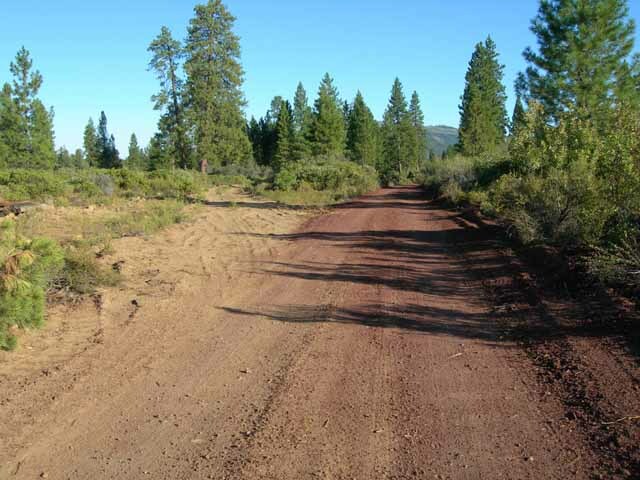 In June 2004 McCloud Rails staff spent a long day on various backroads, searching down the Lookout Line. The last train to Lookout ran six months before, and BNSF had an abandonment application on file with the Surface Transportation Board. The line hung in suspended animation, waiting for whatever the winds of fate brought it. Time finally ran out for this line in late fall 2005. 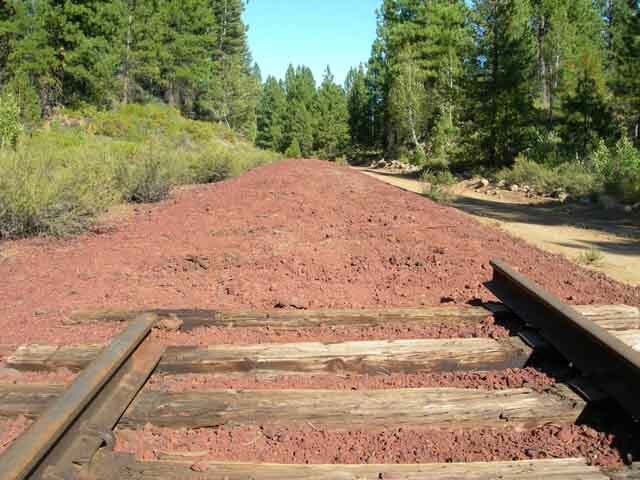 A six month negotiating period for the BNSF and the Rails to Trails Foundation to agree on trail use for the roadbed ended in December 2004 without an agreement, and in the following fall an A&K Railroad Materials crew arrived on scene to begin their work. The woods east of Hambone had seen eight full decades of railroad operations; all fell silent as the scrappers claimed all metal and any other salvagable materials off of the old grade. 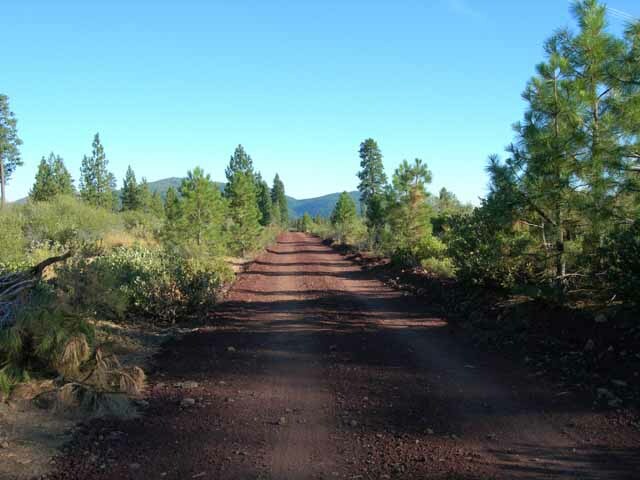 At least part of the old grade has been graded and now is a fine road. McCloud Rails staff made a return visit over part of the line in late August 2006 to re-take some of the photos. What a difference two years can make. We will start this tour in Hambone, CA. 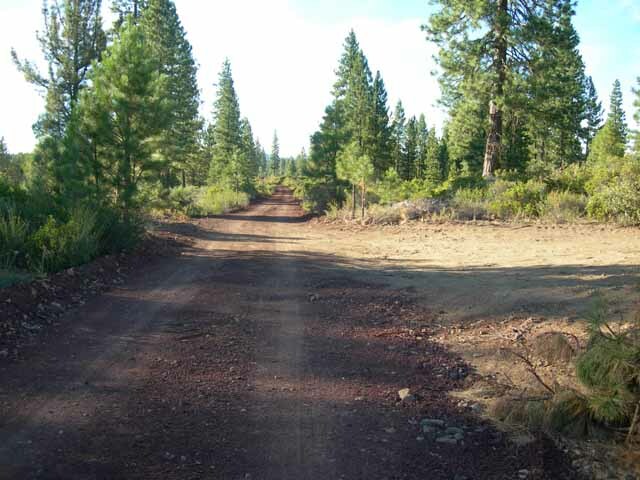 As related elsewhere on this site Hambone first became a place on the map in the early 1920's when the McCloud River Lumber Company established a camp named Pondosa at this spot. The camp lasted for six or seven years and grew to include a large shop building and locomotive service facilities in addition to the buildings needed to house and feed the loggers and other woods based employees. In 1927 the lumber company moved the entire camp, including the name, to the present site of Pondosa. This area first became known as Old Pondosa and then as Hambone, reportedly after a ham bone nailed to a tree to indicate the nearby presence of water. In 1928 the lumber company pushed a new rail line eastward from Hambone, headed for the newly acquired White Horse tract to the east. 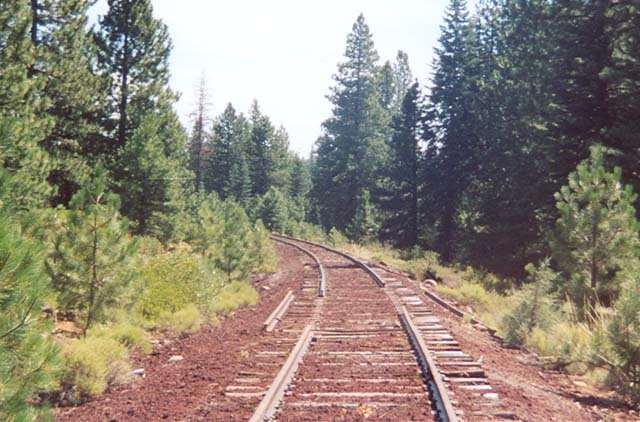 Hambone remained as just another station on this line until 1930, when the Great Northern, Western Pacific, and McCloud River Railroads picked the place as the future interchange point between the three railroads. 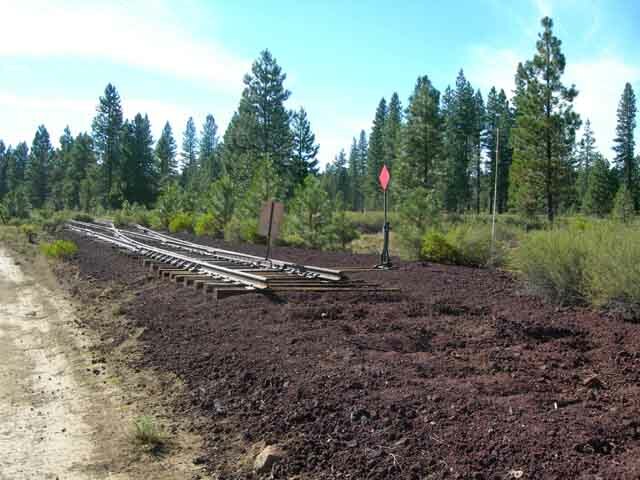 The common carriers planned a large yard and locomotive service facilities, but in the end the Great Northern hired the McCloud River Railroad to operate the Hambone-Lookout Junction trackage as their agent. 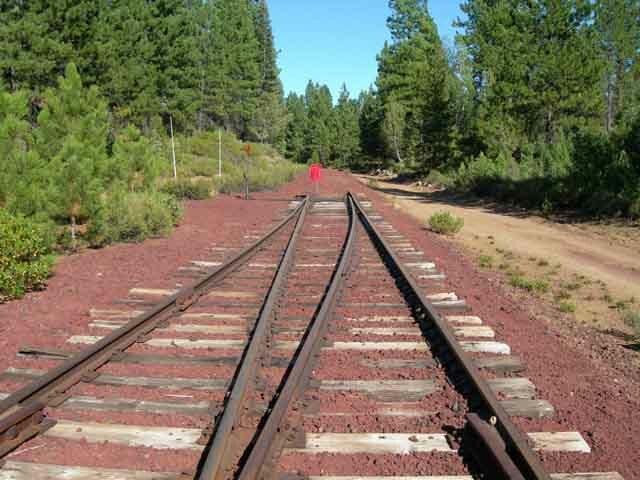 McCloud River freights rolled right on through Hambone for the next seventy years, with nothing physically marking the ownership train. The Great Northern financed operations east of Hambone, even though it looked like any other part of the McCloud River system. An Elkins Cedar Mill sawmill and camp once again brought industrial activities to this remote corner of the world from the mid-30's to mid-40's. 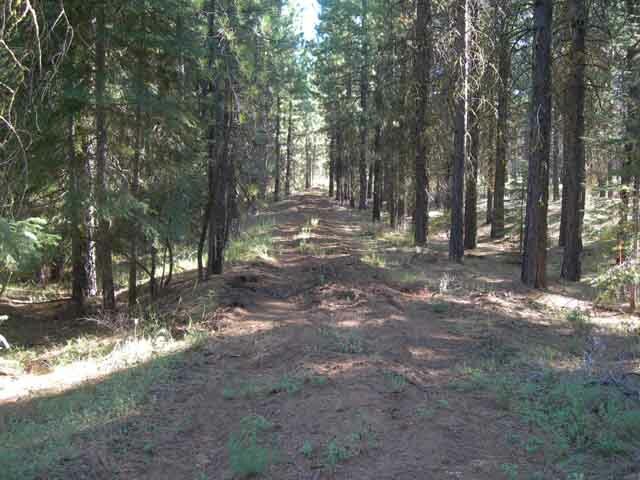 In 1956 the McCloud River completed a line change that bypassed the old camp to the north. A station sign, a siding, and a shed dragged north to the new alignment marked Hambone thereafter. In June 2004 Hambone lay in a state of suspended animation. Everything was present except for the trains. The old camp and would be junction spot would feel the rumble of two more trains- the work train that ran to the ballast pit at Porcupine in November 2004 and the freight that finally came into town to get the boxcars on the siding in November 2005. 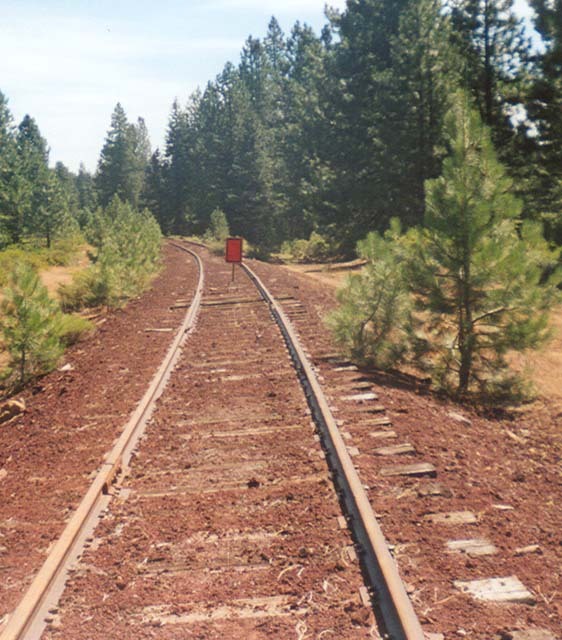 By early August 2006 BNSF had placed this red flag between the rails just east of Hambone siding's east switch. Scavengers had made off with the station sign, but nearly everything else remained. BNSF removed two rails a hundred feet or so beyond the red flag. By August 2006 the red flag had been moved to a point in between the points at the east switch, and the scrap crews started their work just beyond that. A closer view at the new end of track. One last view of the new end of track at Hambone, looking west. Legend has it that Chippy Spur got its name from events at a camp located in the area immediately north of here. The story goes that a camp cook asked lumber company officials if a recently orphaned niece of his could come live with him until she could get back on her feet. The company gave their blessing, and shortly afterwards the niece arrived. 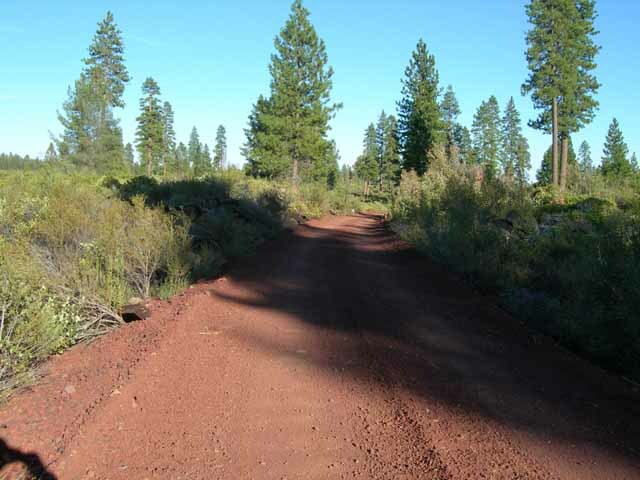 Within a few weeks company officials noticed two trends, the first being a sudden increase in various venerial diseases appearing at the company hospital in McCloud and the second being a flood of employees flocking to this camp on their off time. The company put two and two together soon enough and fired the cook, but not before the employees gave this spur the name that has stuck since. In later years a few hundred feet of trackage remained in place running back into the woods from the mainline, and for several years railroad employees kept an old caboose in the spur to act as a weekend lodge, especially during hunting season. Chippy Spur in June 2004, looking east. The same view in August 2006. Near the end of Chippy Spur, looking back towards the mainline. June 2004. Chippy Spur, looking west, June 2004. 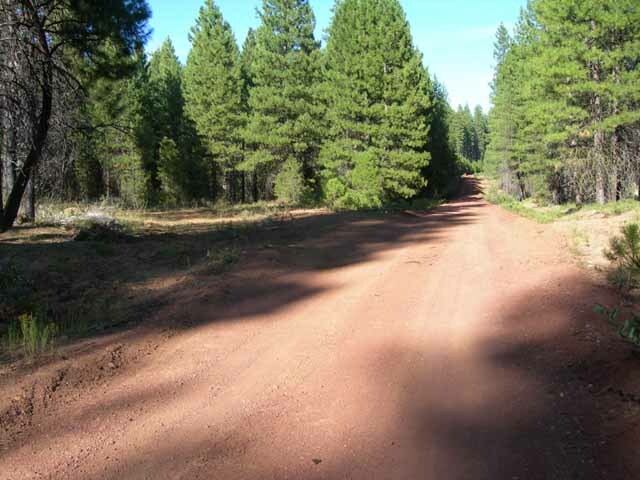 The McCloud River Lumber Company first reached Porcupine at the dawn of the 1920's. 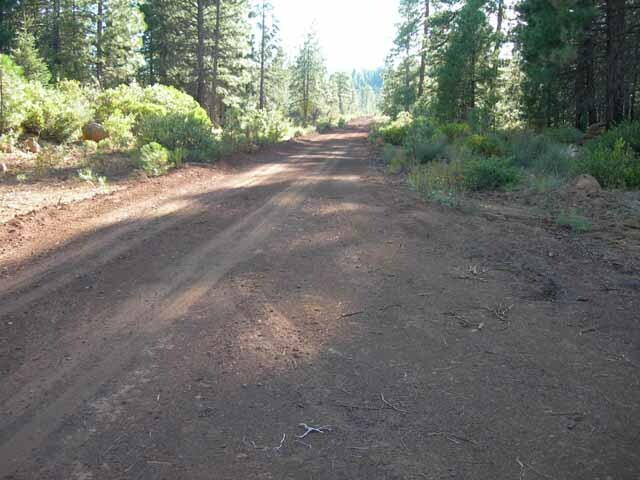 A U.S. Forest Service timber sale brought the lumber company to this area just long enough to build the needed logging railroads, cut the timber, and then get out. The lumber company built a second line through the area again in 1928/1929, this one to reach the White Horse tract to the east. This new line passed next to a small butte that held vast quantities of volcanic cinders. The discovery launched a period of quarry operations that lasted for almost eighty years. The McCloud companies used the pit as the ballast source for all railroads owned or operated by the companies, and the decades of mining activities turned what had been a small butte into a giant hole in the ground. Porcupine Spur switch in June 2004, looking east. The pit is off to the right. Two miles past Porcupine the railroad entered the Giant Craters Lava Flow, a recent overland lava flow that originated on the southern shoulder of the Medicine Lake Highlands volcano and flowed south. In this unlikely spot the railroad maintained a siding for many years named Lakin. The company named the station point after Bert Lakin, an especially popular superintendent with the lumber company who lost his life fighting a forest fire immediately west of McCloud. By the later years much of the old siding remained in place, but only the western switch remained intact. A station sign marked the approximate location of the former site of the east switch. 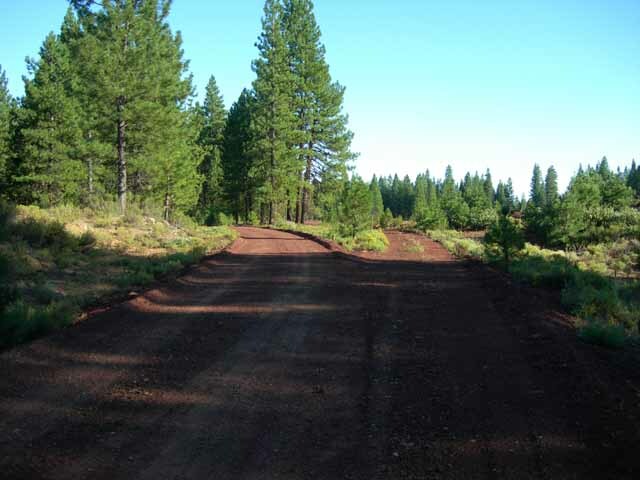 Milepost BH-23 sat just west of Lakin. Here is is in June 2004. The same view, August 2006. Lakin spur switch, June 2004. The Lakin station sign, near the former site of the east switch, June 2004. Lakin would be as far east as we made it on this day. This is a general view looking east from Lakin, down the rest of this former railroad line that must wait for another day.